WeatherTech Cargo Liners provide complete trunk and cargo area protection. 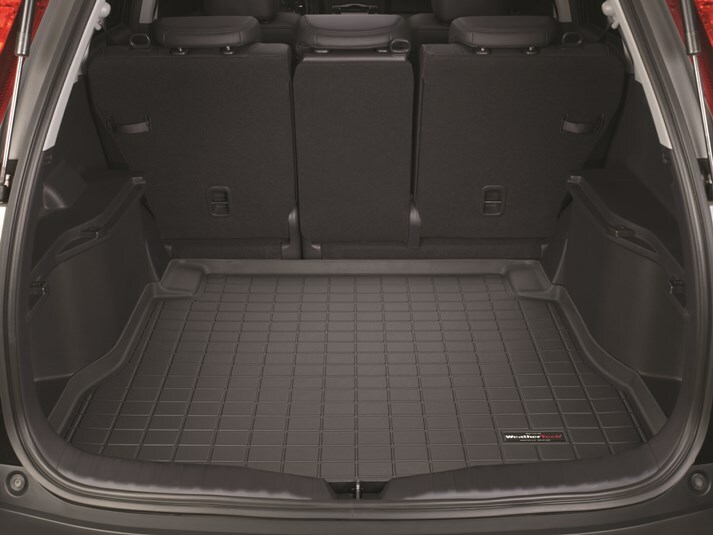 Our Cargo Liners are digitally designed to fit your 2011 Honda CR-V and feature a raised lip to keep spills, dirt and grease off your vehicle’s interior, protecting your investment from normal wear and tear. There is NO reason to buy a manufacturer cargo liner when you can get one from MacNeil (Weathertech). It fits PERFECTLY and is tacky (sticky) enough to keep cargo from sliding around but not so much that you can't get move your luggage/cargo around easily. When my girlfriend bought her '09 Civic the first thing we did was get her a cargo liner and a full set of floor liners. Cargo Liner - Great Purchase! When we purchased the cargo liner for our Honda CRV, we were concerned how our dog would react. But the rubber is actually a little pliable and soft., so it doesn't hurt her feet to stand on it when she's in the back of the SUV. Great purchase, it really protects the cargo area and is a breeze to clean. I just received the cargo liner for my 2002 Honda CR-V today and I am very pleased with the appearance and the custom fit. PERFECT. Also delivery was speedy. Have purchased your products in the past . Ordered floor mats for the front and rear and mat for the cargo area of Honda CRV-SE. The order was placed on 3-4-17 and was delivered the morning of 3-8-17. Great products . Watched the video on installing in a Honda. Great directions and super easy to understand and to follow. Just remember to remove the installed floor mats and then put in your Weather Tech products. Thanks again for a great American made product!!! I purchased the cargo liner for my 2015 Honda CR-V. The liner fits perfectly and looks great! I can put wet and dirty things in the cargo area without worrying about damaging the carpet. After a couple of months of having to chase groceries around the cargo area of my SUV I finally decided to purchase a cargo liner. Its like night and day. No worry over spills or leaks and everthing stays put. Plus the carpet stays clean. Fit was perfect too!. Wait time to receive the order was short as well. Would definitely purchase again and recomend to friends.